First time exhibiting in Hannover EuroBLECH, world’s biggest industrial fair, Conveyor 22 experienced an amazing week with our partner Finstansteknik as well as many visitors. Swedish tool maker Finstansteknik has built one Black Line 141 into its compact stamping tool. This was implemented into a stamping press in SEYI’s stand. 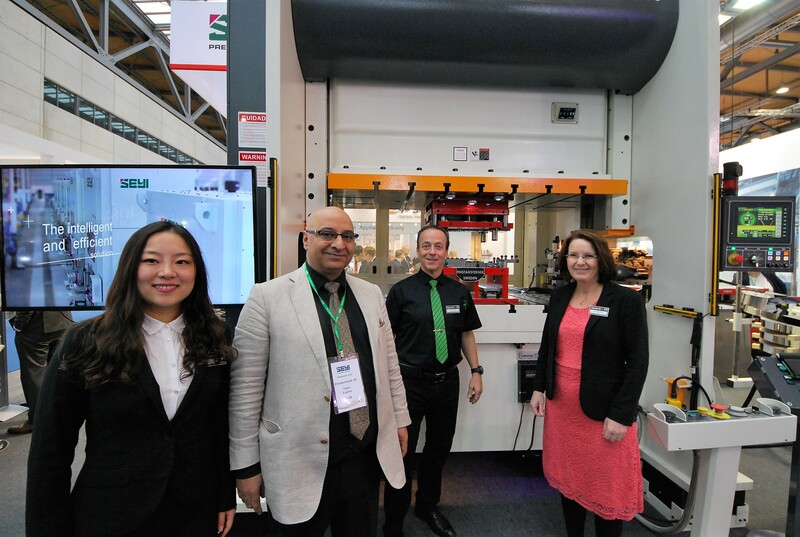 SEYI is well known for its advanced servo presses from Taiwan. In the fair, several major resellers from America, Germany, Italy, Netherland, Czech Republic and England have shown great interests to sell our products. 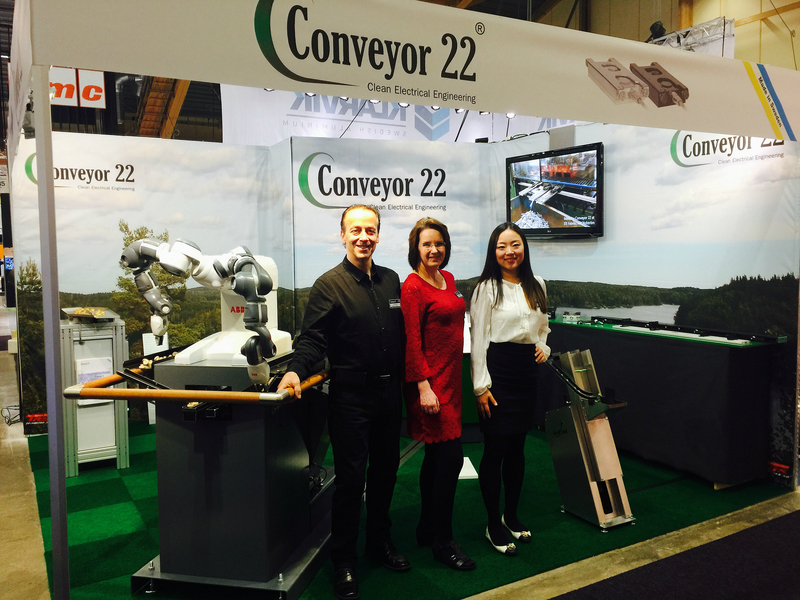 Thanks to Finstansteknik’s invitation and hospitality, Conveyor 22 looks forward to meeting more customer needs all over the world. 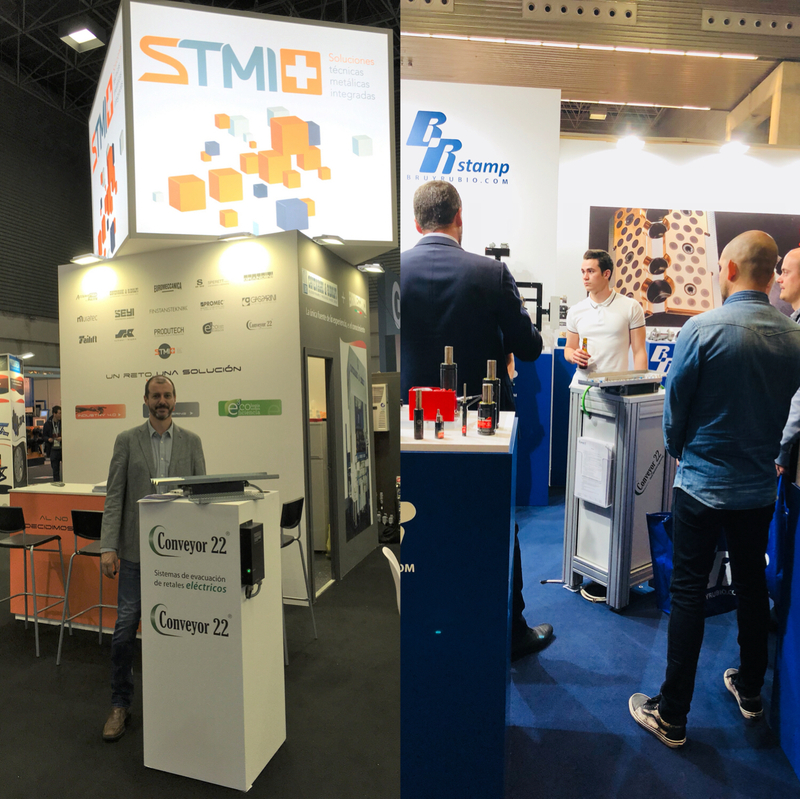 First time exhibiting in Spain, BIEHM International Machine Tool Exhibition, Conveyor 22 had a fantastic week with our resellers Bru y Rubio and STMI. The interest for the conveyor was big and we met many potential customers. Bru y Rubio established in 1962 with more than 10,000 customers, currently presents in Europe, South-Africa and South America. The company offers a wide range of high quality components and services for injection moulds. BR stamp is the new division created by Bru y Rubio to meet the needs of die and stamping customers. STMI, it is a company specialized in design, manufacture, integration, distribution and installation of machinery and production lines for the sheet metal forming industry. Through the combination of their extensive experience and wide customer base, we are looking forward a long-term cooperation and a successful sale in the Spanish market. Among 1020 companies in Olofström, Conveyor 22 AB is honoured to be approved as one of the 26 best growing companies 2017. Olofström is the winner of Best Growth community in Blekinge province of Sweden for the third time. Best Growth measures three different variables of all Swedish companies: increased number of employees, increased profits and sales growth of more than five percent. 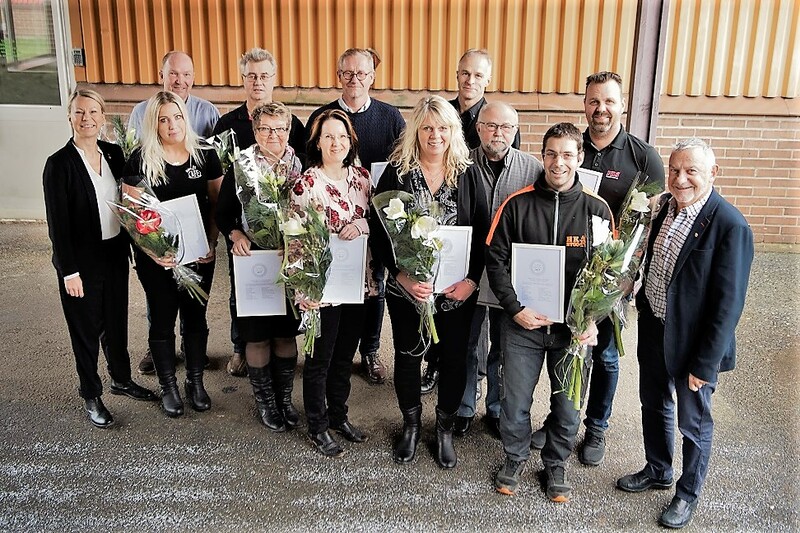 Olofström is famous by its long history of metal processing and as the industrial core of stamping technology in Sweden, where based Volvo and many subcontractors such as Shiloh and EBP i Olofström. Read the news from Olofströms Näringsliv: Olofström vinner Bästa tillväxt i Blekinge, för tredje gången! First time exhibiting in Germany, Blechexpo International trade fair for sheet metal working, Conveyor 22 had a fantastic week with our business partner Schwer + Kopka GmbH as well as many visitors. 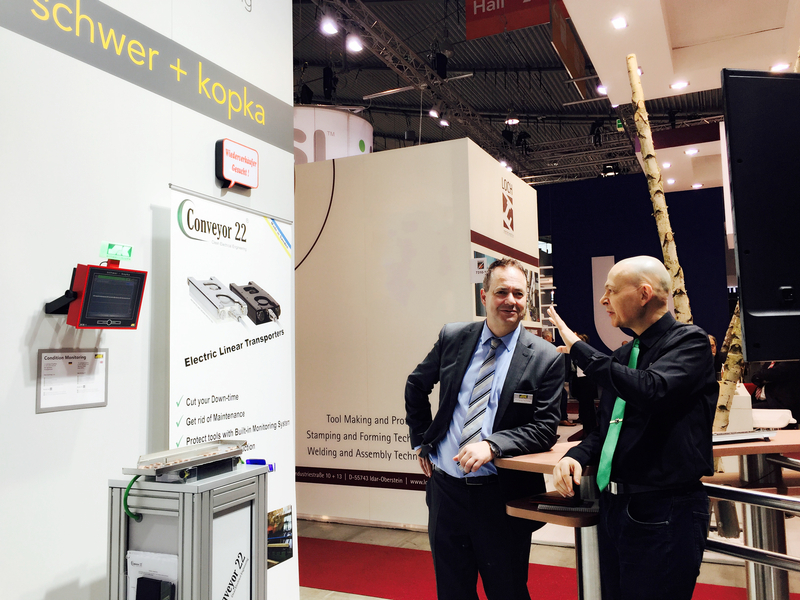 Thanks to Schwer + Kopka’s invitation and hospitality, we have presented two linear conveyors connected to their monitoring system in the SK stand. Visitors were able to see very low energy consumption on our conveyor. We also showed the new conveyor ECS-181 to the market and received many new international business contacts. Combining 27 years’ experience and leading market position, Schwer + Kopka GmbH stands for practical industrial solutions for process monitoring and reliable fault detection combined with network production data collection for monitoring the manufacturing machines for metal industry. We are honored to have co-exhibited with SK on Blechexpo fair for the German market. Traditional conveyors are seldom equipped with self-alarm systems, therefore they fail on communicating with the stamping press and preventing damages. Downtime due to malfunctioning of these conveyors can be very costly either in forms of production interruptions or, in worst scenario, tool damage. Piling up scraps caused from output problem risk shocking and breaking stamping tools and damaging press equipment. Even if the production could be hailed promptly, the productivity is adversely effected by time consuming troubleshooting. – Being deeply aware of such key issue, I integrated a motion sensor into our conveyors which works as a self-monitoring alarm system. In the event of an interference, our conveyor talks with the operating system directly through sending a warning signal. The whole production line becomes halted without external sensors needed. We give maximum security to our customers. – Conveyor 22’s conveyors make our job easier. In case of interference, we get an alarm from the conveyor and we can see exactly where the problem exists without troubleshooting needed. Now we do not risk getting scraps piled up which could cause tool damage. We are very satisfied with Conveyor 22. – The electric conveyors are fully integrated into the stamping press tool and controlled by our PLC system. The evacuation duration of these conveyors is programmed from first punching to a few minutes after last punching. “Sometimes what never happens, is the most important of all”, as Volvo says. The security of conveyors should be one of the most important buying criteria, when take into account the overall costs of stamping tools and press equipment. Small output devices matter a lot. Conveyor 22 has developed a space saving plate for inserting an entire output device into various manufacturing machines. It can be pushed in or under a stamping tool and locked in a few seconds. With the double hand tensioners, the whole conveyor unit is stably locked in the tool. Quick Cassette is available in different versions with three different options on width. – Without this solution for our output problem, we had not been able to undertake this stamping project. – The equipment has been working perfect since the first day. It is so quiet that you risk forgetting to turn it off when the working day is over. Conveyor 22 has developed an easy and cost-effective solution for moving the complete conveyor unit among manufacturing machines. It has been successfully delivered to Lindab Profile AB in Förslöv. Stamping presses are commonly equipped with one or more conveyors for getting the surplus and finished part out. A permanently installed conveyor in a fixed position can be complicate and difficult to reposition, wasting valuable time and resources. For example, rebuilding the whole conveyor system when changing tools or not using the conveyor while the machine is out of production. The accumulated cost of handling such a fixed conveyor system is high. 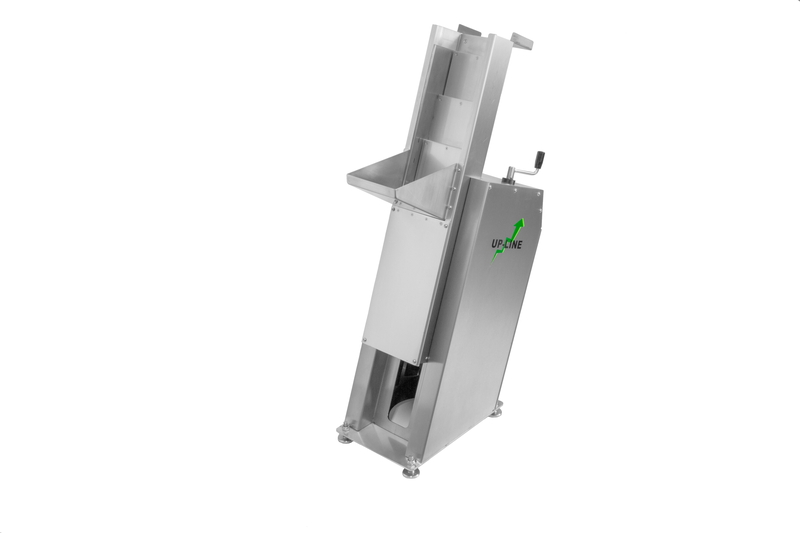 As an additional method of mounting the conveyor on a manufacturing machine, the Steady Stand is an alternative attachment to fasten the conveyor with feeding trays and other extra features. Thus, the usage of output device becomes infinitely flexible and efficient. Several satisfied customers are already using Steady Stand in their production lines. On this occasion, we designed a low-profile model “Steady Stand 500” and equipped it to fit beneath Lindab Profile’s stamping press: Conveyor Black Line 141, Steady Stand 500 with 3-wheel adapter ensuring stability on uneven surfaces and tray support with sliding parts. The control box is mounted directly on the Steady Stand and the cable between conveyor and control box is stored within the stand. 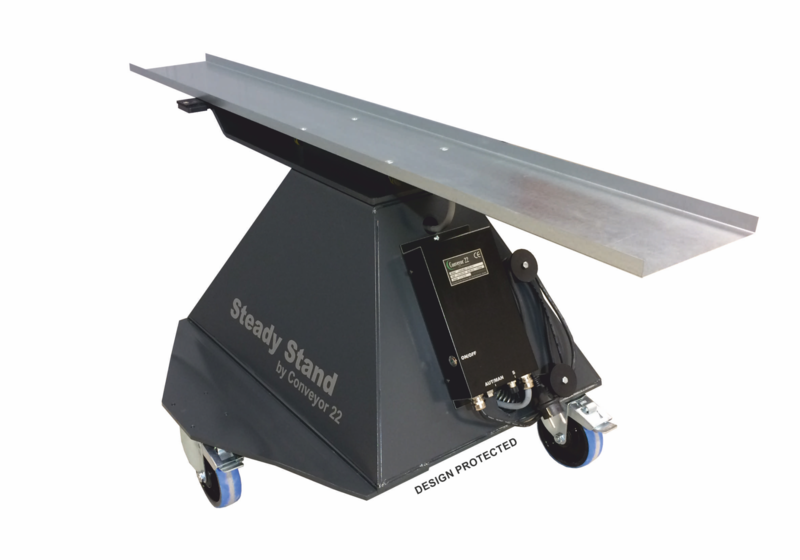 Steady Stand 500 is concrete-filled, weighing 150 kg and has lockable wheels. 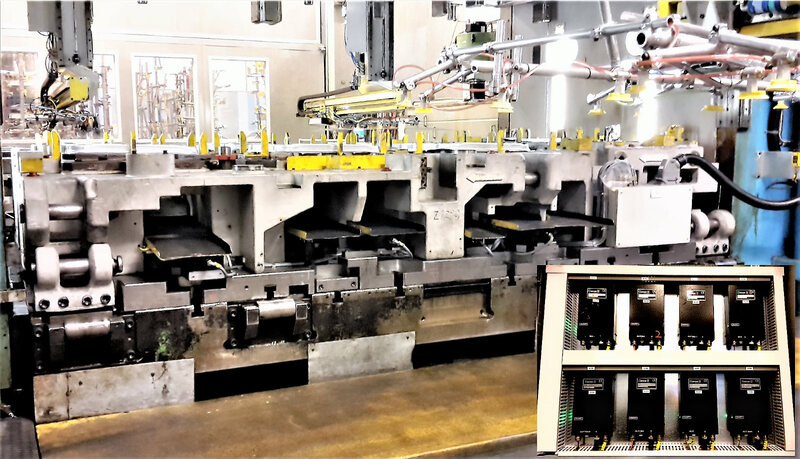 We want the stamping press industry to maximize the use of our conveyors and make their production faster, more efficient and profitable. Exhibiting in Elmia Subcontractor for third time, Conveyor 22 had a fantastic week with our business partners ABB, IVISYS and El-yta as well as many visitors. In our stand, we presented the linear conveyors Black & Clean Line, new vertical conveyor Up Line and YuMi robot cell from the corporation project between Conveyor 22 and ABB. 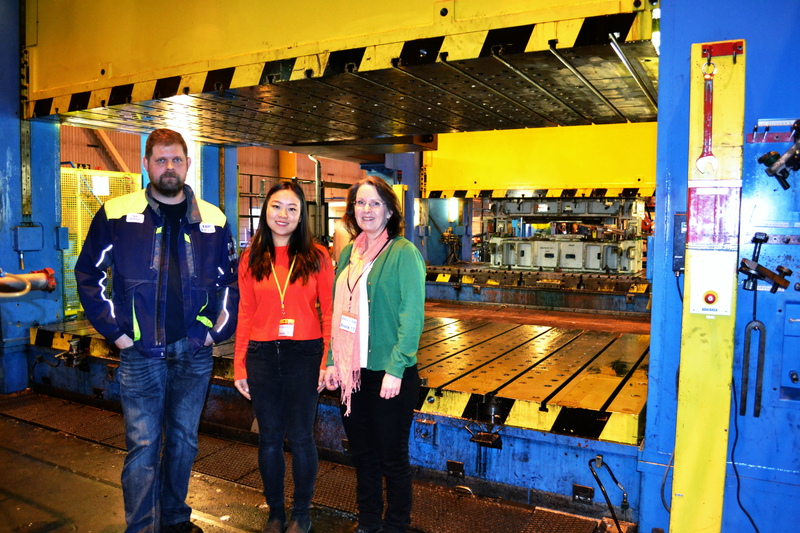 Visitors were able to understand the integration of linear and vertical conveyors working as a whole conveying system through YuMi’s assembling. Moreover, we also designed two applications in order to demonstrate individual functions; coin circulation for Black & Clean Line and bead circulation for Up Line. Many visitors stopped at our stand and started interesting discussions with us. Vision company IVISYS brought our coin circulation into their stand to corporate the new vision system. Many visitors were interested in this combination of linear conveyors and mobile vision. Our supplier El-yta, a surface treatment company, also presented our Black Line in their stand as one of their processed products. We are pleased that Conveyor 22 satisfied its business partners and created potential business opportunities for them. Conveyor 22 has reached many goals in Elmia Subcontractor 2016 where we presented our new product portfolio to the market, received many new national and international business contacts and developed deeper relations with our business partners. We would like to specially thank ABB, IVISYS and El-yta for your cooperation with Conveyor 22, as well as new and old customers for your continuous interest in our electric technology. Conveyor 22 presents an invention “Back-Track Tray” – to solve a common issue of returning details within automation applications. The entire system consists of two conveyors, Up Line and Black Line 141 with two feeding trays, one delivering tray and one returning tray. 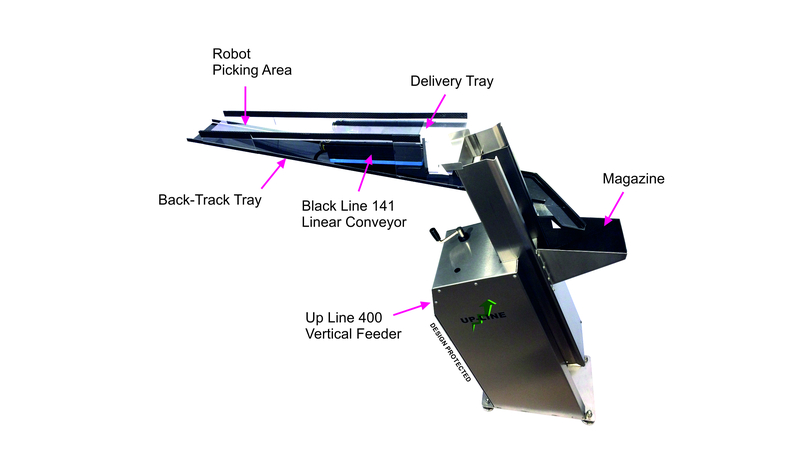 The unique motion created by linear conveyor Black Line, together with the force of gravity, enables Back-Track Tray to transport the details backwards. Firstly Delivery Tray moves the details forwards for the purposes of viewing, picking or placing in a fixed position. Then unpicked or defective parts are gently returned by Back-Track Tray to the magazine. Lastly Up Line returns the details to complete circulation. Conveyor 22 now launches a new linear conveyor for vertical transportation, electric driven and double action step feeder, Up Line. Double action describes the operating principle that every step moves up and down alternately, resulting in high capacity. Up Line orients and raises components over short to medium heights easily and gently, which minimizes wear and tear on the material being handled. Output height setting is 190 mm adjustable with a crank. Magazine is customized depending on the sizes of transported details and low filling height is user-friendly. This flexible step feeder is a good option, the noise level is low and the size is compact. Up Line, with its built-in inductive sensor, is perfect for automatic feeding and presentation of parts for any assembly, inspection or secondary application. With the combination of Up Line and Black & Clean Line, Conveyor 22 is ready to deliver a more complete conveying system and fulfill more customers needs.